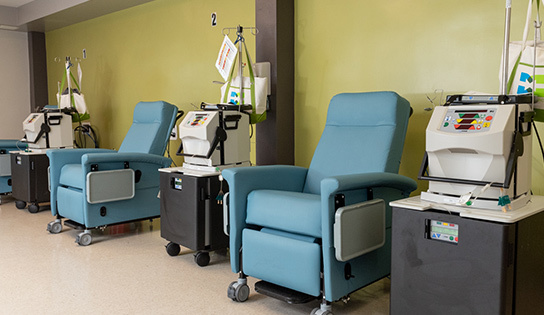 Dialyze Direct offers in-house hemodialysis services, supporting the healing process of patients in the comfort of their own space, allowing patients to enjoy the most from their rehabilitation experience while at The Chateau. Our specialty program uses the most advanced NxStage equipment in a tailored treatment plan that focuses on the individual as a whole. Here at The Chateau, patients on dialysis have a voice in their plan of care. Patients can now avoid challenging transportation accommodations, anxiety, and long wait times at an off-site center. Our services are committed to providing patients with a person-centered treatment plan that focuses on the needs and wants of the individual, facilitating anticipated faster recovery times and reduction of stress.